Manufacturer of a wide range of products which include ss step ladder. Our organization has emerged in manufacturing and supplying a comprehensive array of premium quality SS Step Ladder. 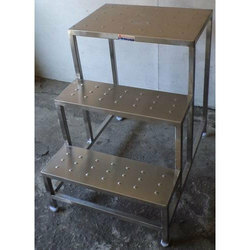 The offered range of stainless steel ladders is manufactured by our experts in accordance with the international quality standards. Further, Available in various sizes, these stainless steel ladders are highly resistant to corrosion.